The Bardswell Blog: Intermission: The Lay of Raymond. Intermission: The Lay of Raymond. Taken from part 3 of "The Poor Preachers" (yet to be published) . A balad sung by Gwendolyn Harper, Minstrel - Bardwoman, descendant of Raymond de Chalmonay. 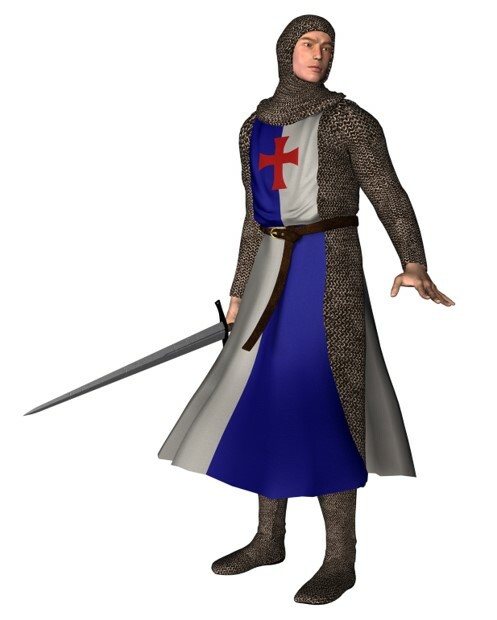 The noblest knight in Normandy was young de Chalmonay. Last in retreat, first in advance; his fame was noised through Northern France. Him few could worst with sword nor lance, nor arrow swift could slay. Yet would he, when the battle’s done, the wounded tend ‘til setting sun. For mercy, kindness, there were none could match de Chalmonay. They stormed the wall of Saxon shields, and blood was shed on Hasting's fields. So they defied, and so they bled. “All other would long since have fled! O worthy, valiant foemen!” said Raymond de Chalmonay. The arrow struck, bold Harold died. "The day is lost!" the Saxons cried. “The day is ours!” the duke replied. The Saxon’s dream was gone. As grieving Saxons laid his cloak o’er Harold Godwinsson. So through the fleeing host they raged to butcher, maim and slay. Good Ralph Fitzwalter shook his head. “’Tis shendful!” to his friend he said. When Raymond saw, his wrath it blazed. Then rode he forth with weapon raised. "Put up your swords, lay down your bows! Art Norman knights, not carrion crows! For shame! Cease ye these needless blows!" cried young de Chalmonay. To calm, persuade or soften blow or bear the maimed away. Thus many a needless death was stayed by Raymond's shield and parrying blade. So evermore is this displayed - the Arms of Chalmonay. 'Mongst Saxon maids t'were none so fair as Æthel of the Golden Hair. She look'd out from her tow'r in prayer that Harold would prevail. On Hasting's fields. All three were slain - the last line of Mardale. Their sad remains must be interred, so with her cousins she concurred. In haste to Hastings forth she spurred. Her face was proud but pale. Amongst the fallen didst she seek, midst shattered limb and bloodied cheek. Though maid she was, she was not weak, the heiress of Mardale. Until within a sheltered grot she saw him live but frail. Said he “My lief, brave daughter of Mardale.. Thus grieving, face eternity, O Æthel of Mardale. Yet all our valiant warriors fell – the best have passed away. Cried she "Then say'st thou 'tis my fate that from my foes I choose my mate? But Normans all my soul should hate, who kinsmen mine assail!" Quoth he “Strange things have passed of late; and hatred spawneth naught but hate. So vengeance must not be thy fate, fair daughter of Mardale. And did we not this land invade By Hengist's sword and Horsa's blade*? Thus for our father's sins we paid on Hasting's fields this day. Just as for Harold's cause I bled, likewise such path our foemen tread. Not willingly our blood he shed, this knight de Chalmonay. Thy brothers fell beneath the tide of Norman swords, and bravely died. A parrying sword blocked fatal knife - the sword of Chalmonay. Therefore I see my daughter's face ere I must pass away. Said he unto me: ‘Raymond de Chalmonay. Five twelvemonths gone our duke made war on Britt’ny's lord, who scorned our law. Full eager, I, my sword to draw and ride with our array. And add more lustre to the name and house of Chalmonay. But when scaled we their castle wall, I fell to my dismay. While shattered, helpless I did lie, a Breton man-at-arms drew nigh. But death I saw not in his face. Nay, rather mercy and God's grace. Staunched he my wounds that bled a-pace. My thirst did he assuay. Of his own cloth he cut with knife, and bound my wounds midst battle’s strife. To my amaze, he saved the life of this de Chalmonay. "But wherefore doest thou this deed? To tend thy foes that fall and bleed?" Quoth he: "Christ likewise saw my need, and heal'd my soul that day!" Though wist we not each other's name, my life shall ne'er more be the same. A common foeman put to shame Raymond de Chalmonay. Our men drew nigh, so forth he fled. Then laid they me upon my bed. That moment was I born anew, Raymond de Chalmonay. The strongest foeman will I smite, but be he found in piteous plight? He shall find mercy from this knight, Raymond de Chalmonay." "So moved was I," the old Thane said "I called down blessings ‘pon his head. "Yet all my kinsmen now are dead, and so my line must fail. Quoth Raymond "Wouldst thou trust this maid to one who did thy land invade? How then could I this child persuade that I would not betray?" "Bring me then parchment. Bring me quill. With mine own hand shall scribe my will. Her doubts of thee then shall I still, Raymond de Chalmonay." And such a man, yea, could be loved by Æthel of Mardale!" The Thane, he smiled. He wist the end was drawing nigh. My soul to Christ Who will defend my cause and shall prevail! And so the noble Saxon died - the last Thane of Mardale. But when in grief she laid him down, a hand reached forth and grasped her gown. A lik'rous knight of ill renown was Ranulph de Vinail. He gloated o'er her loveliness, his arm would hold, his hand caress. Despitously did he address fair Æthel of Mardale. "A golden guerdon do I find! To bed thee well is in my mind!" Cried she: "False knight! Seek thine own kind! Take thy foul reek away!" A sword, and on its hilts it bore the arms of Chalmonay. Quoth Raymond "So, Ranulph, hast thou forsaken thus thy knightly vow? Before the strongest thou wilt bow; on weakest thou wilt prey!" Well might he quail. He knew the might of brave de Chalmonay. Quoth stern Raymond: "Then get thee hence, else thou in blood pay recompense! And should she suffer more offence, my blade thy back will flay!" Ranulph in shame and anger cried "I go! Take thou thy Saxon bride! But vengeance shall not be denied, Raymond de Chalmonay!" And wondered that she found that place, she came and did not quail. So passion’s fire was kindled for the lady of Mardale. My sword is e'er at thy command, henceforth and from this day. Hast thou not kin with whom to dwell, as haven from we Normans fell?" Quoth she “Nay, but … I trust thee well, Raymond de Chalmonay. For by thy sword thou'st served my kin, thou'st kept thy soul from lik'rous sin. Should thou desire mine hand to win? So be it thine for aye. And to thy mercy do I bow, a dawn of hope hath come, I trow. The conqu'rer of mine heart art thou, Raymond de Chalmonay." Brave Raymond’s deeds were noised abroad and praised by many a Norman lord. “Full worthy he of great reward.” did common soldiers say. And many gathered to behold Raymond de Chalmonay. That e’er a royal court could charm, that Normans seldom see. Before the Duke they both bowed low, then looked she on her former foe. Her hate at last did she forgo for William’s Normandy. For one whose home we do displace. Though fair, she is not frail. For fallen kinsmen she hath sought, for her own peril recked she naught. Hence before thee have I brought brave Æthel of Mardale. That she be honoured in this land, thy conquered realm in which we stand. The iron duke his stern eyes raised upon the maid his knight had praised. His courtiers all were full amazed her valour bold to see. Bow in obeisance to the law and rule of Normandy? To Westminster go I to claim the English crown, this land to tame. Thy cause is lost, but not in shame. The memory shall not fail. “E’en so, lord.” quoth the lady of Mardale. “It was the will of my lost sire that I forsake a Saxon’s ire. To dwell in peace is my desire; thy word and will obey. In chivalry upheld the Right through pain and much travail. In joy and honour forth they went. Their house they raised in Northern Kent. “Unto mine heirs may God extend His strength the parrying sword to bend. * Hengist and Horsa were the leaders of the first Anglo-Saxon colonisation of Britain.